Happy New Year and welcome to January’s blog. Phuket is the number # 1 destination for adventure and outdoor activities in Thailand. There is a great blend of extreme and chilled pursuits for the ultimate tropical break. To get your heart rate up you can try jetboating, parascending, zipline, bungy jumping, kiteboarding, surfing, motorcross, zorbing, diving, wakeboarding, go karting, 4×4 driving, shooting, rock climbing and big game fishing to name a few. This is the ultimate, crazy experience on water! The 20 minute thrill ride is safe for the whole family (minimum height of 1m tall) and includes 360° spins, sharp turns, and incredible acceleration. Feel the g-force and prepare to hold on! The Dragon team will soon be operating from beautiful Naka Island just off the north east coast of Phuket – for an even better experience! Call the guys on +66 (0)95 427 6820. Next up is something we all must do in our lifetimes. Phuket has some awesome zip lines. Trust me, this is a rush! 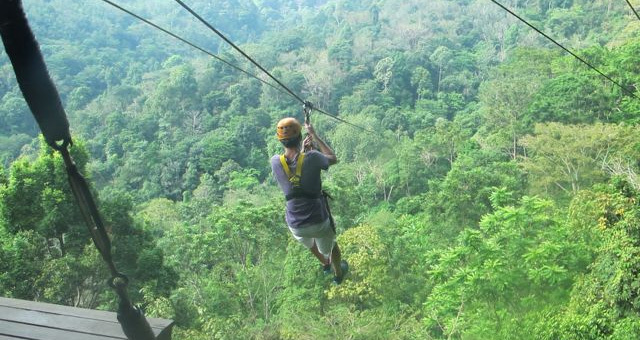 Take a rest from Phuket’s beaches and check out Jungle Xtrem Adventures Park. Climb and zip line the treetops, whilst negotiating swinging walkways, rope bridges and web-like nets. Safety briefings and all necessary gear is provided, along with stunning views and a close encounter with nature! Contact the adventure team at www.junglextreme.com. Also checkout Flying Hanuman located in the centre of Phuket it has an excellent restaurant where you can watch the zipliners fly overhead. Finally let’s look at the long established Phuket bungy jump, only twenty minutes from buzzing Patong. Prepare to jump from 165 ft. above a natural lagoon, surrounded by dark green jungle. Here jumpers can also choose to stay dry, or to be dunked in the water. Don’t forget forget to keep your eyes open! Further information at: www.phuketbungy.com. Phuket has some small surf from May to September. For that “on the wave” feeling there is a flowrider in Kata and Patong at the Phuket Surf House. A cool place to hang out. There are 2 Go Kart tracks. Go Kart Phuket in Kathu next to the Tiger Kingdom and Phuket Kart Speedway who offer the full range of karts, from beginners to advanced in Chalong on the way to Kata beach. If you have not completed your adventure list, its possible to extend your visa in Phuket, by converting a tourist visa to an education visa or Ed Visa as part of one of our language courses. Take care see you soon!